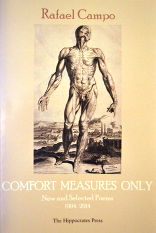 Comfort Measures Only: New and Selected Poems 1994-2014  by Rafael Campo. I’m really not obsessed with how we die. give in to the invidious assault. I really was obsessed, until I died. Pretend to be immortal, once. Cry. I’m not a real doc without my white coat. that addict who thinks he’s got HIV. wishing I could be better than I am. just shock me with the right amount of juice. sake, don’t feel for me. Just do it, don’t sob. It’s likely that as a physician I gain more immediacy from several of the poems — in particular the early one, ’Ten Patients, and Another’, which describes desperate cases coming to the A & E. More accessible is ‘Alternative Medicine’, where Campo presents ten patients on rounds in the HIV clinic (‘Leukopenia’, ‘Cardiomyopathy, IVDU’, etc.) But each one, every ten lines in seeming effortless iambic pentameter, also reveals the humanity of the patient who has the disease — not, as too often expressed on rounds, the disease having the patient. Disease it is, ultimately. There is beauty in the body, but also horror. The physician understands this daily. In the poem ‘Primary Care’ the words express a double meaning: professionally, the initial intervention at a GP’s clinic, and, existentially, the dominant cause of grief, which is bodily decay. The poem goes from ‘Dressed in youth, you dazzle me / with your perfection, body.’ to ‘Body bleed, body stink, / remind us that we suffer, yes remind / us that we must, or else we never lived.’ Here, though it may not be the poet’s immediate intent, I am reminded of the pictures of taken after liberation of naked bodies shovelled into burial pits in concentration camps. 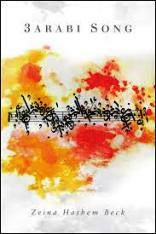 Campo’s poems provide a master-class in writing that combines the best of prosody with the profoundest of human feeling. As Zeina Hashem Beck explains, 3arabi is the Arabizi way of writing “Arabic”. “Arabizi” comes from the combination of the words “Arabic” and “Englizi” (English); it uses numbers to represent sounds that are specifically Arabic, and has become well-known among Arabic speakers (especially online and in texting)’. The 3 here extends the vowel sound of ‘a’. Beck comes from Lebanon, speaks popular Arabic, but writes poetry in English. She also performs her work, here with a backup Arabic chorus: bit.ly/3arabiChoir. Beck was selected by Carol Ann Duffy as a 2016 Laureate Choice for her pamphlet ‘There Was and How Much There Was’ (Smith/Doorstop, 2016). 3Arabi Song won the 2016 pamphlet competition sponsored by Rattle Magazine, a leading American poetry journal. Again like Campo, she writes, unapologetically, ‘political poetry’ — the Arab experience in the 20th and 21st centuries in its emotional beauty and its turmoil. True to the pamphlet’s title, out of the seventeen poems, seven are apostrophes to famous Arab singers — from Egypt’’s Umm Kulthum to Lebanon’s Fairuz. Song and poetry are conjoined, long an Arab tradition. Copious notes provide historical information and translations of Arabic words. Also like Campo, Beck writes mainly in traditional forms, ghazal, pantoum, a mirror poem. Here she is less deft. A mirror poem (‘Listen’), shaped like two hour glasses one on top of the other, tells of a bomb exploding near a mosque, and asks if the poet’s brother went to pray today. One difficulty, not of the Beck’s making, is that there was no room on the page for the whole second stanza, which then carries over to the next page, ruining the visual symmetry. But more problematic is that the mirrored lines have exactly the same content. Some variation subtly changing the meaning would have felt more accomplished. Similarly, the ‘Pantoum for Sabbouha’ repeat lines are replicated almost exactly, and the final stanza doesn’t link back to the first. for the magic that rose out of my throat. but Allah Allah Allah for hours? for this earth. You still haven’t seen my wings. has love ever seen such drunkenness? has sailed the streets of Cairo for hours. We look forward to more such poetry.